Niti Sanghrajka is an Ambler, PA resident who was born and raised in Mumbai, India. She is a graduate of the Institute of Integrative, NYC and the founder of Jiyo : Live Well, where Niti coaches clients on creating sustainable lifestyle changes through nutrition & fitness. She is also the author of Savor the World, an international vegetarian cookbook. 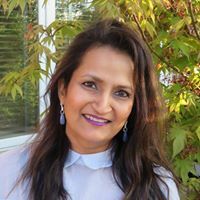 In addition to being a mother of two adult children, Niti has served on the board of WEOF (Wissahickon Educational Opportunities Foundation), is a member of Art Goes to School, and a trustee of Bhartiya Temple. Besides cooking, Niti loves to dance to Bollywood music, is a workout enthusiast, reads voraciously and of course…loves to travel the world in search of the next new culinary experience. I have known Amy Ostroff over the years and have loved her dedication to Love To Langa. My husband’s family is from Kenya, and Africa is very dear to our hearts. I am honored to be asked to consider being on the board.